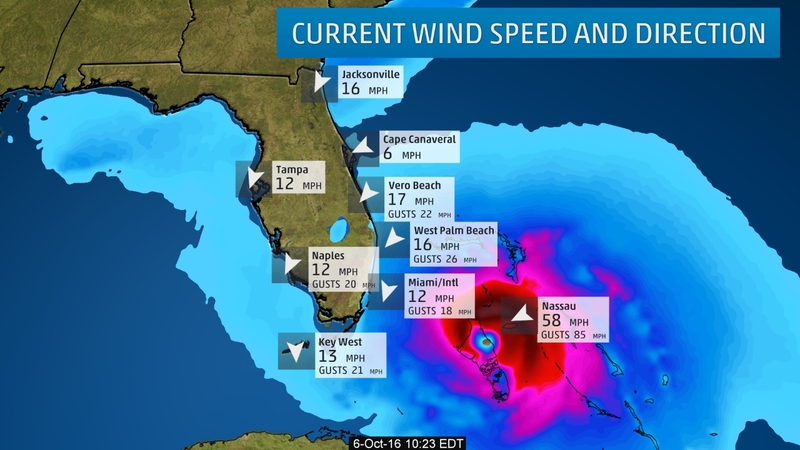 (Weather Channel) -- Hurricane Matthew, once again a Category 4 hurricane hammering the northwest Bahamas, is hours away from beginning a potentially catastrophic, rare Category 4, perhaps even Category 5 siege on Florida's east coast, with dangerous storm surge, destructive winds, and flooding rainfall stretching into Georgia and South Carolina by the weekend. 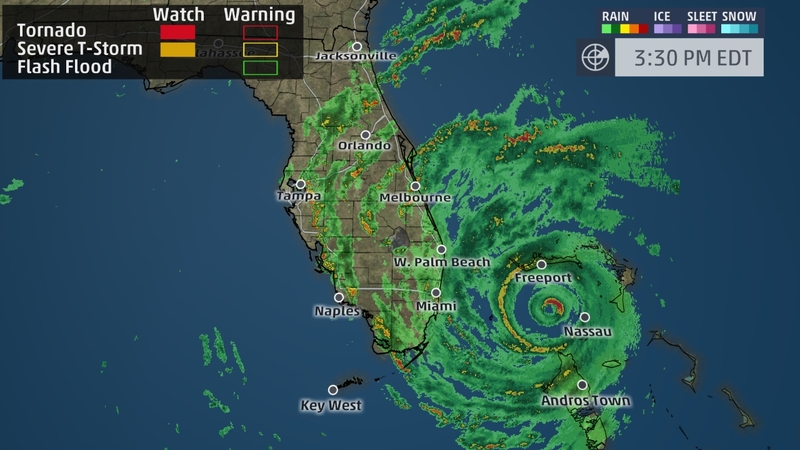 The eyewall may deliver the strongest, most destructive winds anyone in parts of the northeast and east-central Florida coast has seen in their lifetime. The last, and only, Category 4 hurricane to make landfall anywhere in northeast Florida or the Georgia coast was an 1898 hurricane south of St. Simons Island, Georgia. The National Weather Service in Melbourne, Florida, pulled no punches regarding the potential impact, saying Matthew would likely be stronger than any hurricane in recent decades, including the 2004 hurricanes (Charley, Frances, Jeanne) as well as Hurricane David in 1979. WIDESPREAD EXTENSIVE TO DEVASTATING WIND IMPACTS WILL BE FELT. AIRBORNE DEBRIS LOFTED BY EXTREME WINDS WILL BE CAPABLE OF BREACHING STRUCTURES, UNPROTECTED WINDOWS AND VEHICLES. EFFECTS SUCH AS THESE RANGING FROM THE COAST TO WELL INLAND HAVE NOT BEEN EXPERIENCED IN CENTRAL FLORIDA IN DECADES. LOCAL WINDS WILL EXCEED WHAT OCCURRED DURING THE HURRICANES OF 2004. ANY EVACUATIONS AND STRUCTURE PREPARATION SHOULD BE COMPLETED THIS AFTERNOON. TRAVEL WILL BE STRONGLY DISCOURAGED BEGINNING AT DUSK. EXPECT WIDESPREAD POWER OUTAGES. The severe impacts from this hurricane could lead to some locations being uninhabitable for weeks or months, the National Weather Service says. Hurricane warnings have been extended northward to Edisto Beach, South Carolina. This also includes inland locations such as Orlando, Jacksonville, Florida and Savannah, Georgia. Hurricane watches extend to just north of Charleston, South Carolina. A hurricane warning remains in effect along the entire east coast of Florida, as well as the central and northwest Bahamas. All preparations in the eastern Florida peninsula, coastal Georgia and southern South Carolina should be rushed to completion. Satellite and radar imagery show the eye of Matthew making steady progress towards the Florida coast. The northwest Bahamas are still being battered by Matthew, as well. Matthew's tropical storm-force wind field (at least 39 mph sustained winds) extends up to 160 miles from the center, and hurricane-force winds extend up to 60 miles from the center. Some outer rainbands are already pivoting into Florida, with some stronger gusts embedded in those bands. Small, subtle changes in the path of the eyewall, sometimes not resolvable until hours before the passage, will make a large difference on wind impact. 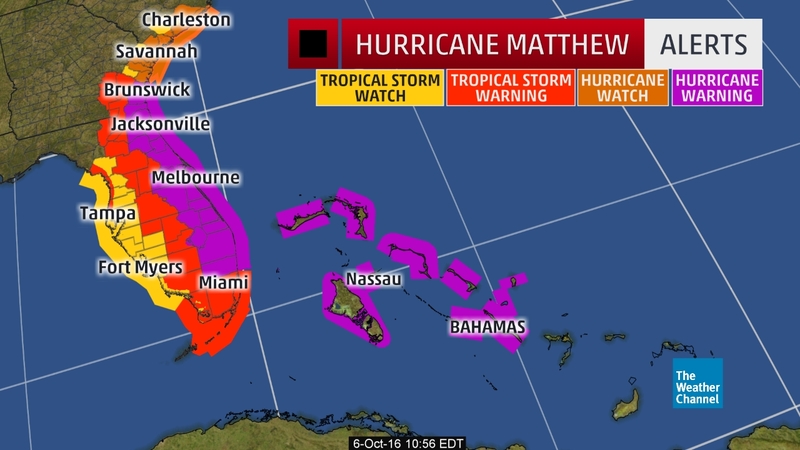 Major, damaging storm surge flooding is expected as Matthew curls its way northward along the Southeast coast. If you live along the immediate coast and are told to evacuate, please do so. Here are times of high and low tides for several locations that could see significant storm surge inundation. 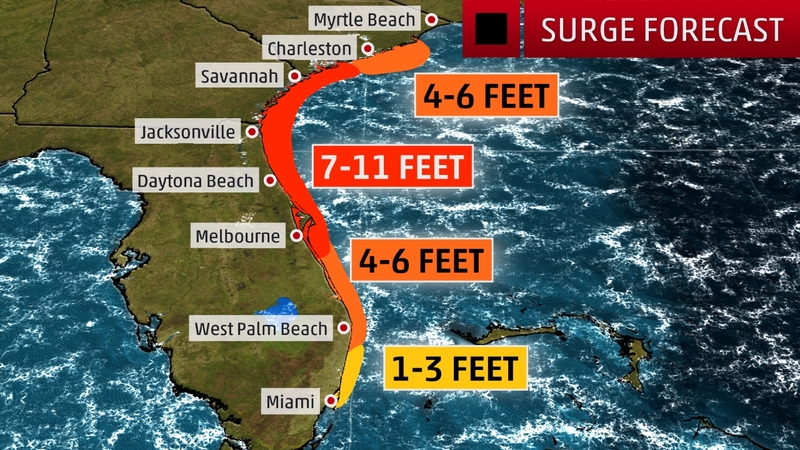 Keep in mind the NHC surge forecasts are "worst-case scenarios" if they occur at high tide. 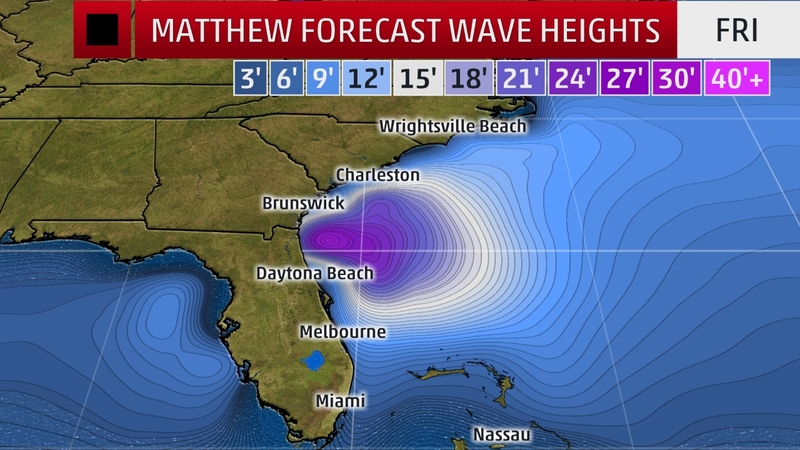 Matthew will also continue to generate large, battering waves along the entire coastline of the Southeast through this weekend. Mariners should stay out of the water given this danger. Of course, major beach erosion is a given with all those factors above playing out. 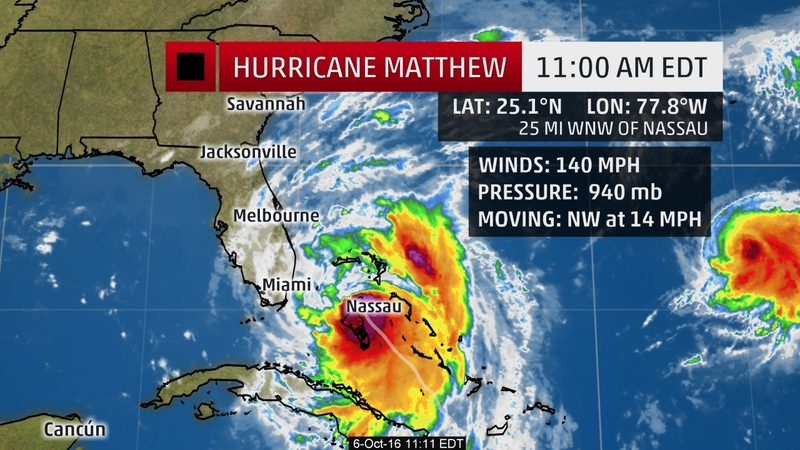 Matthew's eyewall will likely rake a sizable swath of Florida East Coast, as at least Category 4 intensity, and is probable to pass near enough to the coasts of Georgia and South Carolina to bring hurricane conditions to those areas as well. 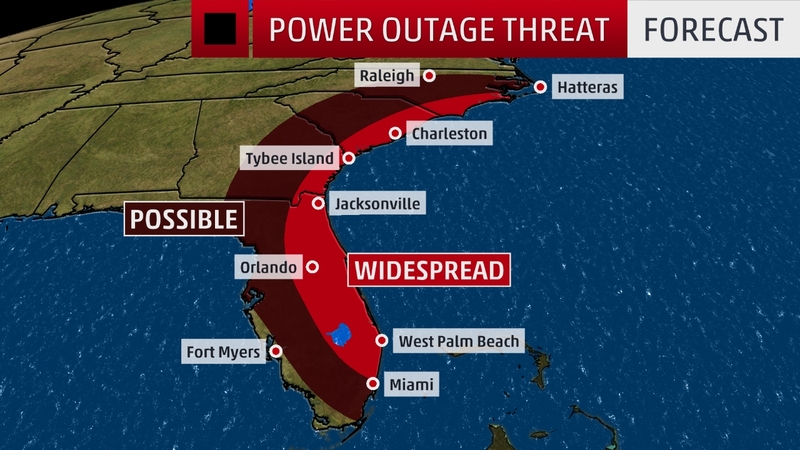 These may be the strongest, most destructive winds experienced along parts of the Florida east coast in decades, and may be of a magnitude not seen by many residents along the east-central and northeast Florida and Georgia coasts. Hurricane-force winds (sustained 74+ mph) are likely along Florida's east coast starting Thursday night, and potentially north of there in coastal parts of Georgia and the Carolinas Friday into Saturday. Structural wind damage is expected along with downed trees and widespread power outages in areas where hurricane-force winds occur. 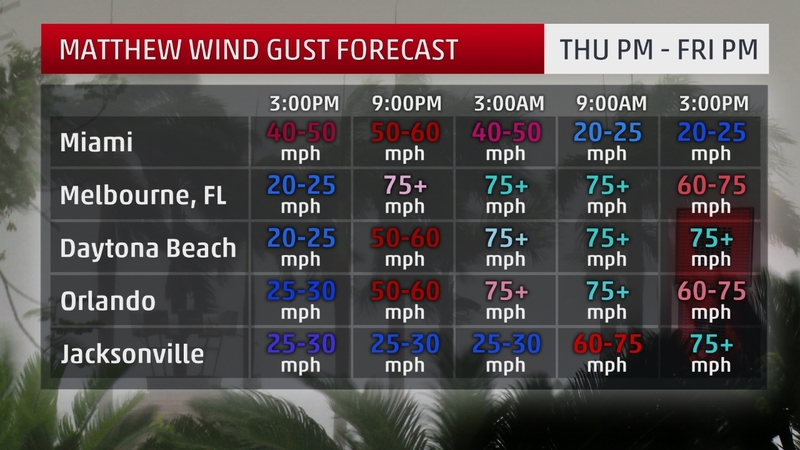 Matthew is forecast to be a major hurricane (Category 3 or stronger) when it moves near Florida's east coast, so extreme wind damage from winds over 100 mph is very possible. The National Weather Service said in a local statement that widespread extensive to devastating wind impacts will be felt along the coast. Power outages could last for many days. Should the center of Matthew ride right along the coast of Florida, hurricane-force winds could occur as far inland as Lake Okeechobee and the Orlando area in Florida. Widespread power outages could occur in those areas, as well. Hurricane-force winds are possible in coastal parts of Georgia and South Carolina Friday night into Saturday. Widespread power outages, tree damage and structural damage is likely. 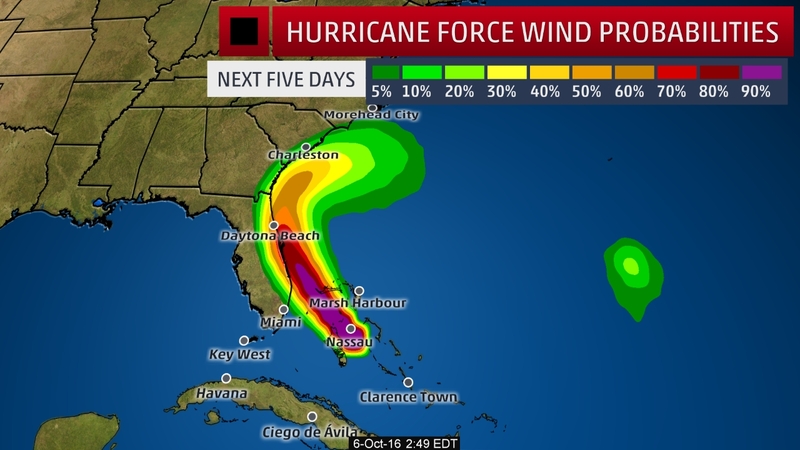 The potential for tropical storm-force winds (39 mph+) will encompass a larger part of Florida as well as southeast Georgia and the coastal Carolinas. These winds could expand all the way to the Gulf of Mexico. How strong those winds are in any one location will depend on where the center of Matthew tracks in relation to the Southeast coast. Even tropical storm-force winds could down trees and knock out power. Two other threats from Matthew are the potential for rainfall flooding and tornadoes. 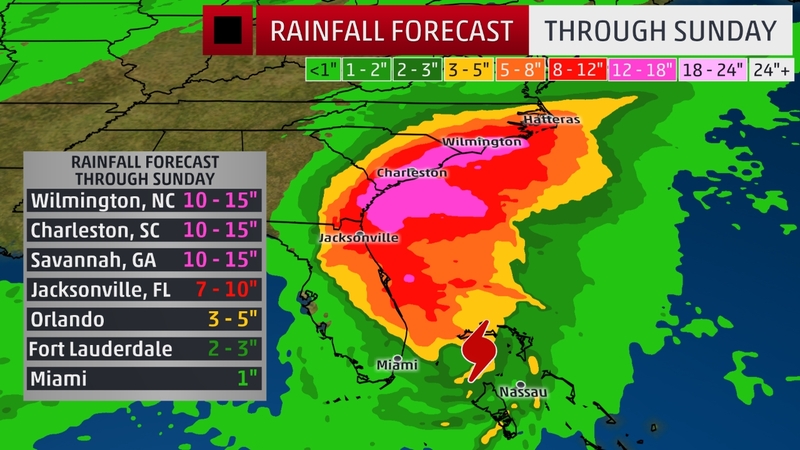 The heaviest rainfall totals, possibly ranging between 5-12 inches, are likely to be confined to the immediate coast, from Florida to eastern North Carolina. There is a potential for even heavier rainfall if Matthew makes landfall. The storm surge will also limit rainfall runoff, aggravating flooding, especially in coastal locations where swollen rivers cannot drain, backing up rivers potentially miles inland. An isolated tornado threat could also develop on the Southeast coast, as Matthew's center draws close. You may have noticed the forecast track has changed radically for areas from North Carolina northward. Matthew will not get "picked up" by a southward dip in the jet stream forecast to push into the Northeast U.S. this weekend. 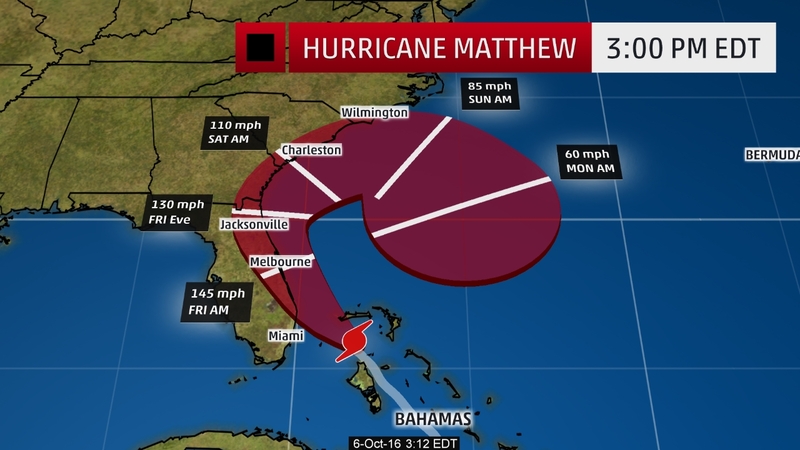 Instead, Matthew is expected to curl southeast, then south away from the coastal Carolinas beginning later Sunday. Matthew is then expected to meander off the Southeast coast or north of the northwest Bahamas into next week, but details on where it may eventually go, including, perhaps a second strike as a weaker system in the Bahamas or Florida, are uncertain at this time. Conditions will steadily worsen in the rest of the northwestern Bahamas, including Freeport. Conditions for the southern and central Bahamas will slowly improve Thursday. Winds have already gusted to 85 mph in Nassau Thursday. Wednesday night, a 119 mph sustained wind was clocked at Exuma International Airport. Sustained winds over 100 mph were also clocked at George Town, also on Exuma. The worst wind and surge impacts, coinciding with the nearest passage of the eyewall of Matthew, will affect the northwest Bahamas through Friday morning. A storm surge of 10 to 15 feet, compounded by up to 15 inches of rainfall from Matthew will lead to life-threatening water rises in the Bahamas. Battering waves riding atop the surge will only compound the damage potential. This is on the order of storm surge witnessed during Hurricane Joaquin almost exactly one year ago, only this time, it may occur over the entire island chain, rather than just the central and southeast Bahamas. All interests along the Southeast U.S. coast should be rushing preparations to completion. Check back with us frequently at weather.com for any important forecast updates. George F.L. Charles Airport on St. Lucia picked up 9.21 inches of rain Wednesday. On the south side of the island, Hewanorra Int'l Airport picked up 13.19 inches of rain in just 12 hours from 8 p.m. Wednesday through 8 a.m. Thursday, according to the Antigua Met Service. Matthew strengthened to a rare Category 5 late Friday evening, becoming the first Category 5 Atlantic basin hurricane since Hurricane Felix in early September 2007. Hurricane Matthew became the fifth hurricane of the 2016 Atlantic hurricane season early Thursday afternoon. According to Colorado State University tropical scientist Dr. Phil Klotzbach, Matthew became the lowest latitude Category 5 hurricane in the Atlantic on record (beating the old record set by Ivan in 2004). Some outer rainbands triggered flash flooding in Jamaica Sunday, hundreds of miles away from the center of Matthew. Interestingly Sunday night, a fortunately-placed NOAA buoy sampled Matthew's eye, providing valuable information for meteorologists. Hurricane Matthew's eye first came ashore in the Greater Antilles in the western Tiburon Peninsula of Haiti near the town of Les Anglais around 7 a.m. EDT Tuesday morning, according to the National Hurricane Center. Matthew was the first Category 4 Haiti landfall since Hurricane Cleo in 1964, and only the fourth such intensity or stronger hurricane to track within 65 nautical miles of southern Haiti's Tiburon Peninsula since the 1960s, according to NOAA's Best Tracks Database. Hurricane Matthew made a second landfall near Juaco, Cuba, around 8 p.m. EDT Tuesday evening. October 4. An unconfirmed wind gusts to 155 mph was reported in the town of Baracoa, Cuba, in Matthew's eyewall. Radar from Guantanamo Bay Wednesday morning indicated Matthew's eyewall had a sizable hole in its western side after passing over Cuba Tuesday night.